'The Monastery', the Mrs. Farquhar Ferguson (née Juliana Armour) estate designed by Allen W. Jackson c. 1908 in Huntington Bay under the supervision of Louis Comfort Tiffany. Armour was heir to the Armour & Company meatpacking business founded by her family. She died in 1921 and the following owner, widow of publisher W.J. Connors, eventually attempted to donate the house to science in 1930. Her offer was taken up by a cancer hospital run by doctors from California but they were unable to secure tax-exempt status on the property after push back from the community and it appears the deal fell through. The house was sold again in 1936 and continued to be privately owned until 1964 when Suffolk County took possession of the estate in lieu of $100,000 in back taxes owed on the property. There seems to have been a plan for the Huntington Arts Council to acquire the property but that never materialized. Six years later in early 1970 demolition on the house began to mixed reaction from the community. The NYTimes quoted the village police as reporting "150 youths a night on the 12.5 acre castle site" where the walls had "long since been stripped of their ornamental tiles and sculpture by vandals in recent years and were now full of graffiti." The Times also quoted a workman doing demolition as saying the house was "built better than the Empire State Building" and that the walls, some few feet thick in places, "succumbed reluctantly to battering" from the wrecker's ball. The estate is also known as 'Ferguson's Castle' and 'Ferguson's Folly'. The property was eventually subdivided. Click HERE to see where 'The Monastery' stood on google earth. 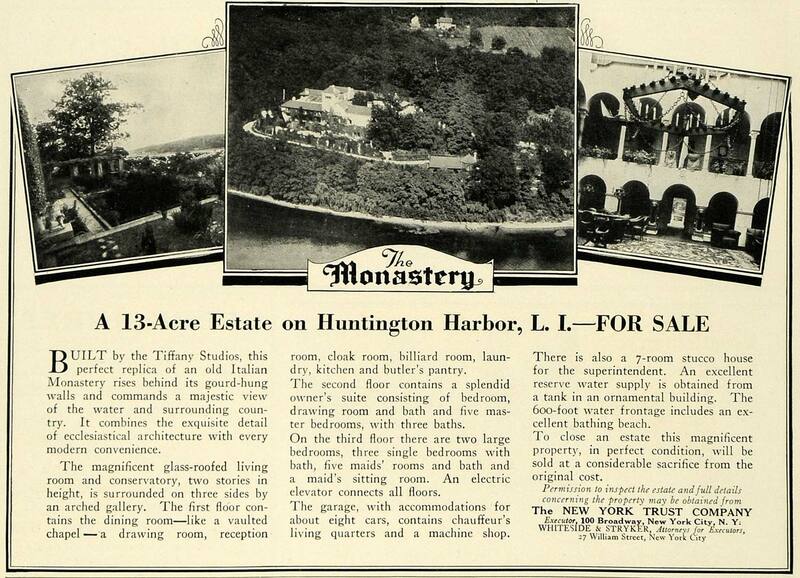 Click below to see 'The Monastery' intact in a 1953 aerial. Advertisement from Architecture, 1923. HATE THIS NEW COMMENT PRESENTATION! Double word password is stupid and no option for email updates. BAD. Yet another gloriously bungled attempt at preservation by the local towns and counties on Long Island. The property was opened for tours at first but that even fell through. Agree that the new comment format is a step backwards. Maybe this is ironic only to me: that no religious organization purchased an estate called 'The Monastery' when several other LI estates -- 'Ormston', 'Inisfada', 'La Selva' (I'm sure there are others) were. To me this is an impressive, somewhat eccentric house on an enviable site -- oh, the possibilities if it had survived. The stories of Mrs. Ferguson dining with dummies of deceased children beggars belief, however. There may be more to be said for Stagers and Neutralizers than we thought. I fondly remember exploring this wonderful place in the late sixties. I loved the staircase with openings overlooking the great hall. While it had long been abandoned and vandalized nevertheless it was still so impressive, I am so grateful to have seen it. There is still a mysterious doorway in the remaining lower wall with a flight of steps, very photogenic. How sad for Huntington to have lost such a treasure! Ancient, thanks for the link -- Mrs. Farquhar Ferguson wasn't quite as Morticia Adams-looking as I might have thought.